ON Semiconductor has a new Automotive Intelligent Power Modules (IPMs) that provides class-leading power density and improve overall performance in on-board charging and other high-voltage DC-DC conversion applications for EVs and plug-in PHEVs. 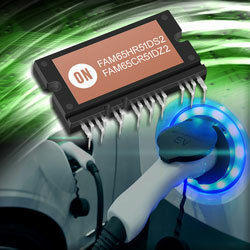 The FAM65xxx APM16-packaged devices provide a fully-featured, integrated solution that eases design-in for automotive clients with one device outline comprising H-Bridge, PFC and bridge rectifier configurations to address applications at each OBC and DC-DC stage. The modules address a fast-growing market as the number of EV and PHEV vehicle designs, and production volumes grow. They can save around 50% board space and significantly ease manufacturability versus discrete component-based solutions. Their small size and weight coupled with high-efficiency levels can dramatically increase power density and system efficiency, contributing to decreased fuel consumption and CO2 emissions for vehicles. The company’s new IPMs also provide enhanced reliability versus discrete solutions and other power modules, due to optimised content and internal layout giving an excellent thermal performance. Furthermore, lower EMI has been reached due to an integrated high voltage capacitor. The devices have an internal direct bonded copper structure that is completely isolated to 5kV AC/second, making them simpler to use by relieving the need for insulation sheets associated with discrete solutions. Safety and reliability are also underlined with compliance to the latest, most stringent automotive qualifications – AECQ 101 and AQG324.